1ADNET Systems, Inc., contractor to the U.S. Geological Survey Earth Resources Observation and Science Center, Sioux Falls, S. Dak, work performed under contract 08HQCN0005. 2Stinger Ghaffarian Technologies (SGT), contractor to the U.S. Geological Survey Earth Resources Observation and Science Center, Sioux Falls, S. Dak., work performed under contract 08HQCN0005. 3Science Applications International Corporation (SAIC). The U.S. Geological Survey’s (USGS) Earth Resources Observation and Science (EROS) Center is generating a suite of products called "eMODIS" based on Moderate Resolution Imaging Spectroradiometer (MODIS) data acquired by the National Aeronautics and Space Administration’s (NASA) Earth Observing System (EOS). With a more frequent repeat cycle than Landsat and higher spatial resolutions than the Advanced Very High Resolution Spectroradiometer (AVHRR), MODIS is well suited for vegetation studies. For operational monitoring, however, the benefits of MODIS are counteracted by usability issues with the standard map projection, file format, composite interval, high-latitude "bow-tie" effects, and production latency. eMODIS responds to a community-specific need for alternatively packaged MODIS data, addressing each of these factors for real-time monitoring and historical trend analysis. eMODIS processes calibrated radiance data (level-1B) acquired by the MODIS sensors on the EOS Terra and Aqua satellites by combining MODIS Land Science Collection 5 Atmospherically Corrected Surface Reflectance production code and USGS EROS MODIS Direct Broadcast System (DBS) software to create surface reflectance and Normalized Difference Vegetation Index (NDVI) products. eMODIS is produced over the continental United States and over Alaska extending into Canada to cover the Yukon River Basin. The 250-meter (m), 500-m, and 1,000-m products are delivered in Geostationary Earth Orbit Tagged Image File Format (Geo- TIFF) and composited in 7-day intervals. eMODIS composites are projected to non-Sinusoidal mapping grids that best suit the geography in their areas of application (see eMODIS Product Description below). For eMODIS products generated over the continental United States (eMODIS CONUS), the Terra (from 2000) and Aqua (from 2002) records are available and continue through present time. eMODIS CONUS also is generated in an expedited process that delivers a 7-day rolling composite, created daily with the most recent 7 days of acquisition, to users monitoring real-time vegetation conditions. eMODIS Alaska is not part of expedited processing, but does cover the Terra mission life (2000–present). A simple file transfer protocol (FTP) distribution site currently is enabled on the Internet for direct download of eMODIS products (ftp://emodisftp.cr.usgs.gov/eMODIS), with plans to expand into an interactive portal environment. 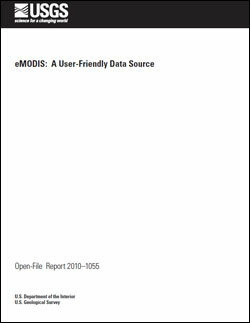 Jenkerson, C.B., Maiersperger, Thomas, Schmidt, Gail, 2010, eMODIS: A user-friendly data source: U.S. Geological Survey Open-File Report 2010–1055, 10 p.